Looking for professional water treatment installation and sales in Bradford or Barrie, ON. or surrounding areas?When you need any type of water treatment call us. We do water treatment installation and repair. 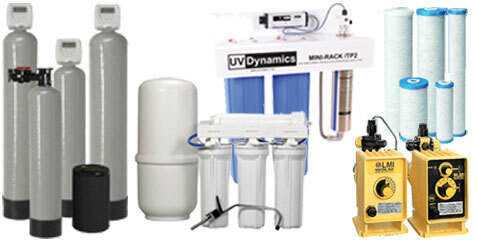 Reverse Osmosis , Water Softeners , UV Filters , Whole House Water Filters. Call us for water treatment. How do carbon filters work? Carbon filters are actually part of a three-stage purification process. They are very beneficial, due to the fact that they remove harmful chlorine from water that has an unpleasant taste and smell. In addition, sediment and contaminants are also removed. The first stage of the filtration process is the utilization of a sediment filter. This removes most of the larger particles and matter. They are commonly constructed of pleated polyester, pleated cellulose, or a spun polypropylene. Pleated cellulose is the slowest of these choices, but it is the most effective. Pleated polyester is resistant to chemicals and bacteria, but it is limited when it comes to reuse capacity. The second stage utilizes kinetic degradation fluxion filters. These remove the chlorine from water by turning it into chloride. These filters are made of zinc and copper, are reusable, and can be recycled. The utilization of activated carbon filters is included in the final stage. The carbon can be porous, a solid, or granular. The negatively charged carbon attracts positively charged contaminants. The contaminants stick to the filter rather than remaining in your water. As the carbon filter gets dirtier, the charge is reduced. The carbon filter needs to be replaced on a regular basis. Reverse osmosis works by forcing contaminated water through a fine membrane at high pressure. It is a slower type of purification process, but it is highly beneficial, because it removes almost every type of contaminant from your water, including radioactive particles. Reverse osmosis will also rid your water of any minerals. How does the process of distillation work? Distillation purifies by heating your water. Water molecules will evaporate and cause condensation on the filter. The purified water will pass through, leaving the impurities behind. This process purifies water to such a great extent that many times it is remineralized before drinking. This is because some minerals are thought to be healthy. What are some other types of systems? There are a few more systems available, but these are used more for specific situations rather than as a whole-house method of purifying your water. Ultraviolet radiation uses UV light to kill any microorganisms found in your water. This system is extremely useful in parts of the world where untreated water can be very hazardous. Ceramic filters are composed of fossilized diatomaceous earth. This filter removes harmful debris and microscopic organisms by squeezing them out of your water. Catalytic conversion filters are used most commonly in disaster areas. Instead of removing harmful elements, this filtration process turns those elements into safer substances. Which system is most beneficial for your home? What are some benefits of water softeners? Water softeners have a number of advantages. More efficient cleaning of appliances, dishes, clothing, skin, and hair are major benefits that come from using a water softener. Hard water has a tendency to leave a soapy residue and white spots on dishes and clothing. It will also cause you to use more soap in the shower, and has a tendency to irritate skin. Soft water also heats up faster than hard water, and has been shown to reduce the cost of both gas and electric bills. Soft water may improve the efficiency of a electric hot water heater by up to 22%. It can improve the efficiency of your gas-powered unit by up to 29%. Furthermore, longer-lasting appliances are another benefit that you can reap from using a water softener. Hard water can be very hard on your appliances, which is why they may not last as long. Longer-lasting appliances not only benefit you, but they also benefit the environment by reducing waste. How often do you need to maintain it? One of the many things about a water softener is that it only requires minimal maintenance. However, you should check the salt level on your water softener at least once a month. Salt will also need to be added periodically. Additionally, your water softener will need to be cleaned once or twice a year. What are some signs you have hard water? If you have noticed damage to your glasses, dishes, and cutlery, then you probably have hard water. The minerals that are present in hard water are what cause the damage. You may notice damage to your clothes if you have hard water. Your white-coloured clothes may begin to turn a grayish color. You may also notice that your coloured clothes are beginning to fade. You could also have plumbing problems if hard water is present inside your home. The minerals that are present in your water can cause clogs inside of your plumbing structures, and may result in systems breaking down much earlier than expected. Furthermore, you may notice problems with your skin or hair if there is hard water in your home. Hard water can cause you to suffer from dry skin. It can also make your hair brittle and dry.